November is National Family Caregivers Month! 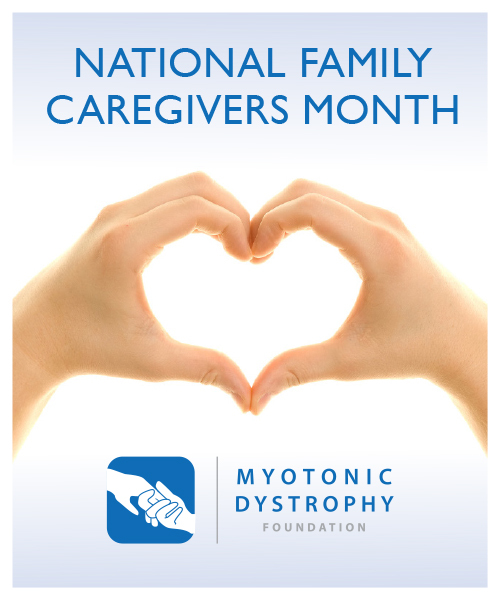 Throughout the month of November 2015, we are honoring MDF caregivers. We will feature an MDF Dispatch interview with an MDF dad and grandfather, and resource articles targeted to helping caregivers manage and get support. MDF will also host a webinar on November 23, 2015 entitled Meditation for Caregivers, led by Dr. Genie Palmer, a former associate professor and researcher at Sofia University. Dr. Palmer is particularly interested in teaching individuals and groups how to establish a daily meditation practice and explaining the health and well-being benefits derived from regular meditation. For more information on the webinar and to sign up, click here. Caregivers are an incredibly important part of the MDF community, and we want to take this month to formally celebrate all that they do. Thank you! © Myotonic Dystrophy Foundation. All rights reserved.